Dr. Samuel S. Mendicino is a graduate of the University of Pittsburgh where he received a B.S. in Biological Sciences. He received his Doctor of Podiatric Medicine in 1983 from the Dr. William Scholl College of Podiatric Medicine in Chicago where he served as the student body vice president. He completed a residency in foot and ankle surgery at the Harris County Podiatric Surgical Residency and was the chief resident during his last year. 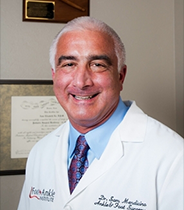 Dr. Mendicino has been in practice since 1985 and is board certified in foot and ankle surgery by the American Board of Podiatric Surgery. He has served on the Board of Directors, Credentials committee, Overall Exam Chair, President-Elect and as an examiner for the ABPS. He is a Fellow of the American College of Foot and Ankle Surgeons, serves on several of the College’s committees, and has served as the chairman of it’s annual national scientific seminar. Dr. Mendicino is the Chairman of the Department of Surgery at West Houston Medical Center. Dr. Mendicino is the director of residency and fellowship training of the Harris County Podiatric Surgical Residency and it’s Fellowship in Reconstructive Ankle and Foot Surgery. He is a past president of the Texas Podiatric Medical Association and has published in several scientific texts and journals. Dr. Mendicino is active in international education and has performed surgery or lectured to orthopedic and trauma surgeons in Germany, Austria, Italy, and Lebanon. He lectures regularly at local, state, national and international surgical conferences. In addition to performing elective, traumatic, arthroscopic, endoscopic, pediatric, and reconstructive surgery of the ankle and foot, Dr. Mendicino provides non-surgical care. Recently, Dr Mendicino has added lower extremity nerve decompression to his practice. This may alleviate the symptoms of lower extremity peripheral neuropathy. Dr. Mendicino’s hobbies include hunting and fishing and he enjoys traveling and spending time with his kids.